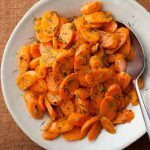 These sauteed carrots are buttery and delicious. They don't take long to prepare so they can be one of the last things you have to prepare. Your guests will love them.Note: You can change the number of people served by placing your cursor over "Servings". The Ingredients will adjust to the new number of servings. Peel the carrots and cut them diagonally in 1/4-inch slices. You should have about 4 1/2 cups of carrots. Place the carrots, 1/3 cup water, the salt, and pepper in a large (10 to 12-inch) saute pan and bring to a boil. Cover the pan and cook over medium-low heat for 7 to 8 minutes, until the carrots are just cooked through. Add the butter and saute for another minute, until the water evaporates and the carrots are coated with butter. Off the heat, toss with the dill or parsley. Sprinkle with salt and pepper and serve.